May 3, 2016 - Hamilton School District. School Board members approved a request to add 10 part-time literacy interventionists that will be financed through special education and Title I and II funds. In all, the cost of the additional teachers will be $145,000 with $87,000 coming from a special education flow-through grant and the rest from federal Title funds. The goal of the new positions are to provide systematic and intensive interventions for students who are not making progress in literacy. In related business, the School Board revised the position description of reading specialists to emphasize their roles sharing and modeling effective literacy instruction practices and assessments that lead to improved student learner outcomes. Their new title, reading specialist and literacy coach, highlights greater responsibility for leadership and practice in effective literacy intervention delivery. The School Board also approved hiring of a teacher as an instructional coach, a new position in the district, to provide instructional support to staff throughout the district. For the past three years the district contracted with a part-time instructional coach to support teachers during their first two years in the district. Research indicates that instructional coaching increases the likelihood that teachers adopt new teaching practices which has a significant positive impact on student achievement. Salary for the position will be determined by the teacher’s background, degree and experience. Marcy special education teacher Jen Emory (right) and Marcy Principal Michele Trawicki described a personalized learning project initiated with Marcy students who were able to participate in a “Genius Hour” to work on projects they were passionate about. A variety of curriculum projects and professional development workshops focusing on district initiatives will keep staff members busy throughout the summer. School Board members approved a wide range of curriculum projects and professional development opportunities as presented by Instructional Services Supervisor Katherine Little, Ph.D. The budget for the summer work is $35,967. Workshops include elementary mathematics training and implementation planning, middle school mathematics curriculum resources review, high school special and regular education co-teaching refresher, elementary and middle school RtI comprehensive intervention model training and planning, reading specialist instructional coaching training, interventionist training, middle school critical literacy training, new teacher orientation and closing the achievement gap workshop for new teachers. In addition, the Technology & Learning Academy will be held Aug. 30 during the district in-service. Denise Schwid was presented with the annual district Community Service Award for her role in supporting families in the community through the Volunteer Organization of Women of Sussex (VOWS), the Hamilton Education Foundation and Spring Fest. 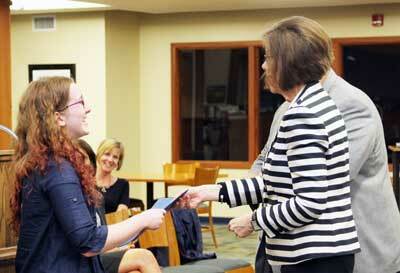 Hamilton junior Erin Magoon was recognized for qualifying for national competition in National History Day. Hamilton DECA members Mackenzie Jene, Kayla Muckerheide and Andrew Tai were on hand to be recognized for qualifying for state competition. Others who qualified but were not able to attend the meeting were Matthew Miller, Caitlin Bolz, Bobby Mae Cranfield, Janelle Davies, Julia Gahr, Miranda Gammon, Carolyn Troutman and Tyler Vandermolen. 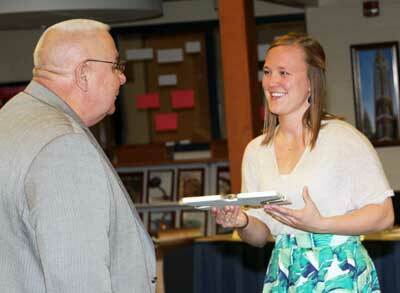 Lannon Elementary School staff were congratulated for earning a Title I School of Recognition Award. 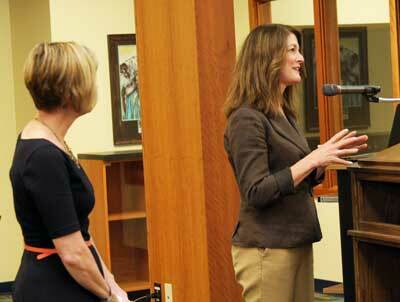 Templeton grade 8 teacher Kelly Menden was publicly commended for earning a WACTE Early Career Educator Award. approved continuation of the Employee Assistance Program through the National Insurances Services at no cost to the district.